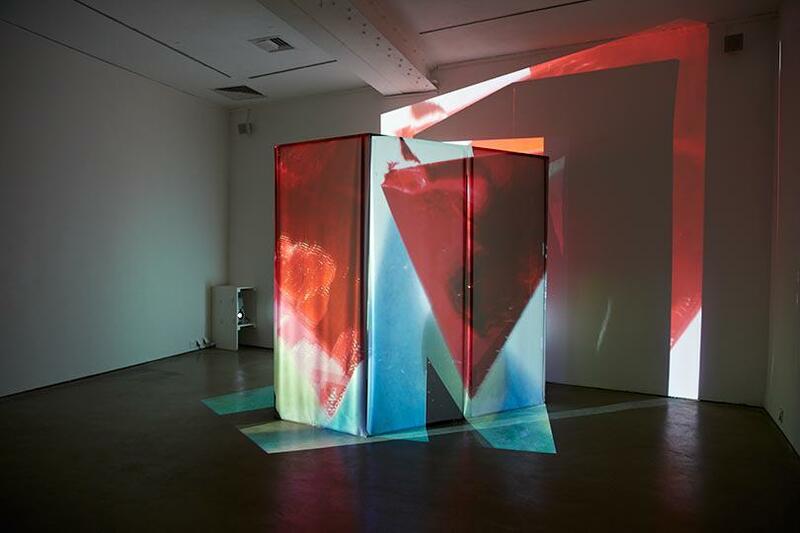 Three kaleidoscopic installations of sound, film and sculpture by Laura Buckley form ‘The Magic Know-How.’ For this exhibition at Site Gallery, Buckley taps into a rich vein of material apparently derived from the subconscious of both artist and viewer. In fact, she collages everyday images to evoke dream-like bodily and sensory pleasures. These are augmented by a soundscape of electronic music made in collaboration with Andy Spence, incorporating fragments of laughter, speech, the sound of water and other elements from the artist’s daily routine that blur boundaries of time, place and person. 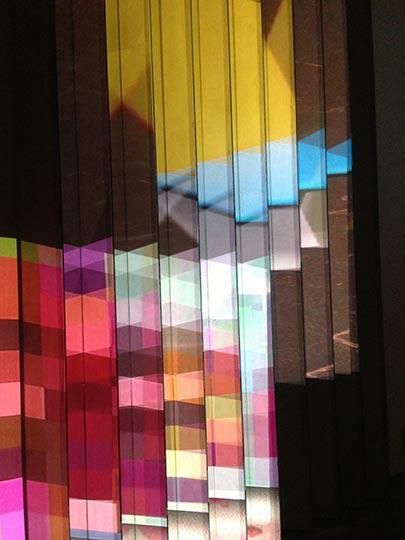 The exhibition begins with an installation of layered projections on a wall-mounted corrugated sculptural form. 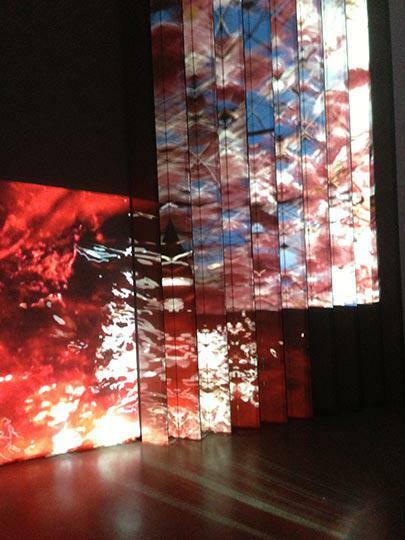 Images of blossom, champagne bubbles, muddy puddles, what appears to be blood and abstract linear forms are scattered by mirrors on to adjacent walls. 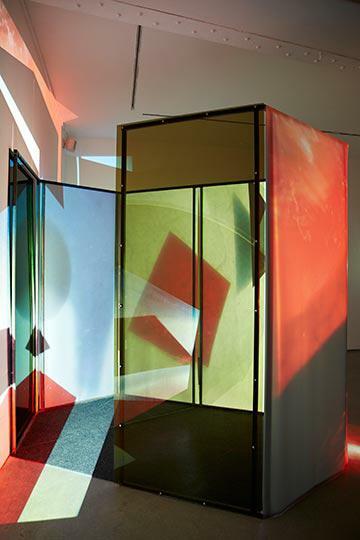 As the viewer struggles to grasp and assemble these moving images, reflections slide across the floor; forms are stretched beyond their immediate frame of projection, and are edited to fit the specific frenetic rhythms of a complex dubstep soundtrack. 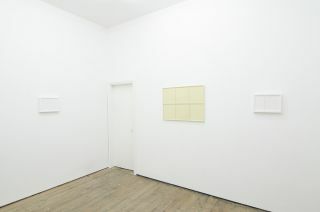 Changes in tone are marked by a speeding of sequence, transference between a heavily saturated colour palette and more muted shades, and an increasingly loud sonic whine, lending the work, at times, an oppressively hallucinatory force. 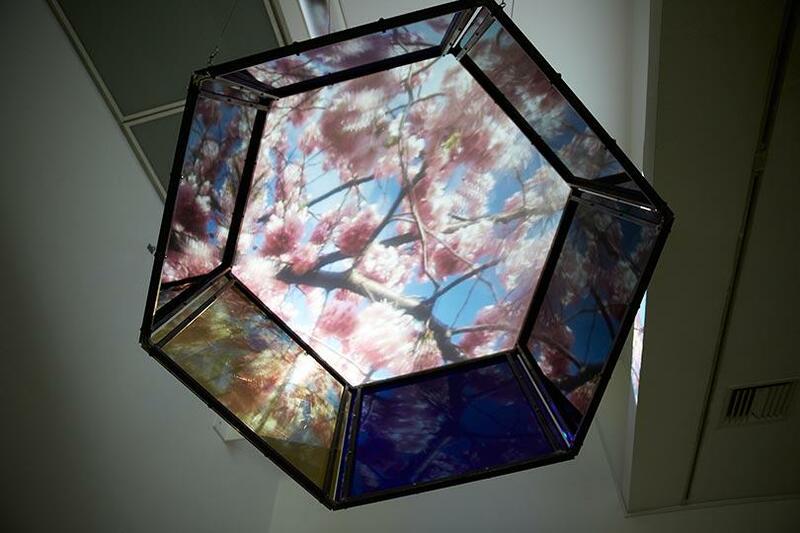 Buckley’s second installation is shown within a three-dimensional hexagonal projection screen suspended from the ceiling, almost like a satellite. A tall, seven-sided structure houses her last work. Here, images of hot pink and bright yellow Perspex shapes floated on water reflect the sky and dazzling sunlight, and recall the process of developing of photographs. Fittingly, the soundtrack to this work, with its delicate science-fiction-like chimes, calls to mind a clear sense of transportation or transformation. 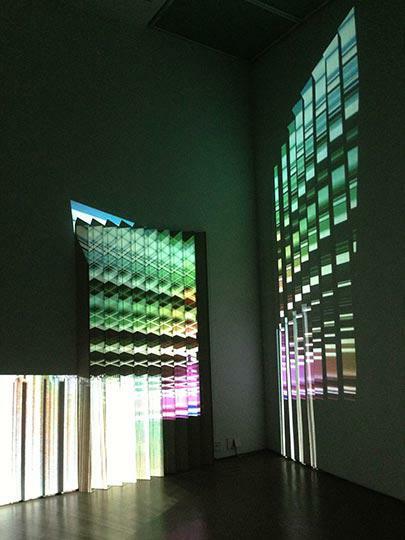 Films are projected on to and through the delicate translucent screens, and can be viewed from inside and outside the structure. 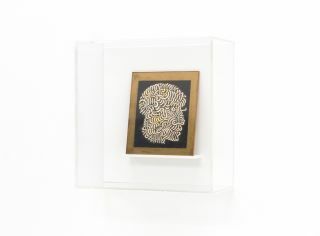 This work offers a welcome sense of peacefulness: it is calmer, its images slowed, its effect more sensual, and the sculpture intimately encloses the spectator like a protective shell. The formal geometry of the screens is pleasingly echoed in the outline field of the projectors and the images themselves being projected. Playfulness and order are thus combined, and as seemingly accidental slivers of light and image are cast across the space’s surfaces, their effects are manipulated by materials that reflect and refract. 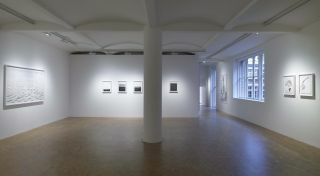 Like her exhibition ‘Fata Morgana’ (2012) at Cell Project Space, Buckley’s current show is an immersive work, although the viewer is afforded greater freedom at Site Gallery in shaping a unique physical and psychological experience of this illusive work. Viscerally, Buckley’s total environment is suggestive of being meta-physically located inside not just a space, but an unknown body. Repeated beats in the music recall an antenatal heart monitor, distorted and yet familiar, or a ringing in the ear like tinnitus, explicitly connecting the installation to the viewer’s own body, memory and subconscious mind. Buckley’s luscious flickering images are almost tangible but ultimately remain simply projections: illusions of form, space, light and sound that cannot be contained nor fully comprehended.